The Springfield, IL Soldiers Aid Society is a support group for the 114th Illinois Regiment Reactivated. Typically the group was busy putting together boxes to send the soldiers in battle. Click for a link to a PDF that tells more about their origin. The Springfield, IL Soldiers Aid Society supports historic sites such as the Old State Capitol, Edwards Place, and the ILES House. We are present at the Tuesday evenings retreat ceremony at the Lincoln Tomb from June - August. This ceremony gives visitors a chance to be one of the lucky ones to receive the American Flag that has flown over Lincoln's Tomb the past week. 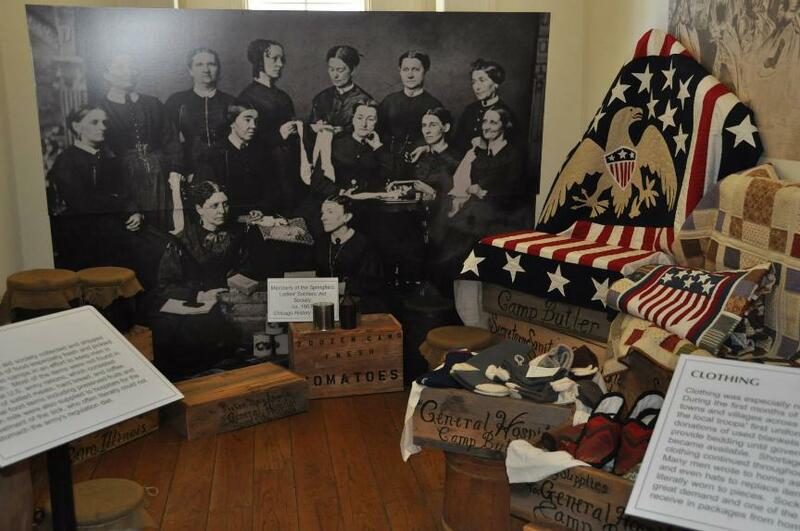 The photo above at the Old State Capitol is an actual picture the Springfield ladies in 1863 that organized a box project. All members will uphold the goals the SAS and honor those of the 114th Infantry Regiment Illinois Volunteers (Reactivated) to which the SAS is affiliated. 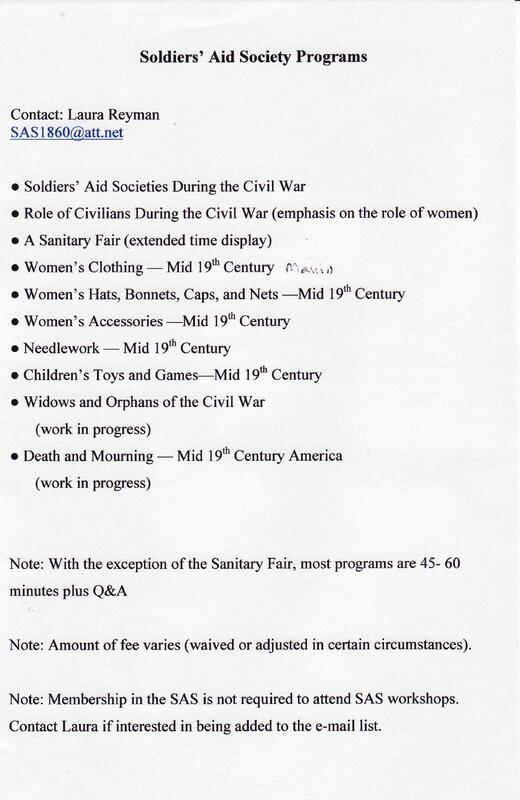 It is the goal of the SAS for its members to portray respectable members of society and strive for authenticity in representing civilians of the American Civil War period (1861- 1865). This will include age and impression appropriate dress and deportment. We do this to educate both the public at large and ourselves in particular, in order to provide an accurate and authentic “living history” experience. SAS members are encouraged to develop a fully rounded and authentic impression. Members will stay in complete period attire when camps/events are open or when interacting with the public at balls, tomb ceremonies, etc. Members living/participating in camp and/or in Company Mess will be responsible for camp cleanliness and assisting in the preparation and/or clean-up of meals. This will be coordinated with the military and tasks assigned. All children (under the age of 18), adult family members, or adult guests of an SAS member who are participating in any event must stay in period clothing while the camp/event is open. The sponsoring SAS member is responsible for the child’s care and must arrange for the child’s care if the sponsoring SAS member will be away from the camp/event. The behavior of any adult participating under the sponsorship of an SAS member is the responsibility of that SAS member. NOTE: If the SAS member is not a parent or legal guardian of the child, the SAS member should complete an SAS parent consent form and medical treatment release before the event. Modern electronics (cell phones, walkie-talkies, music and game devices, etc.) will not be permitted at reenactments when the public is present. If a person must make a call, he or she is expected to move away from the location or to a private place in order to maintain the period atmosphere. Discreet photography is permitted. Prospective members will attend at least one SAS meeting and three events or activities within four months or less prior to being considered for membership. Final decisions on membership rest with a consensus of the current membership. To be considered an active SAS member requires participation in at least two events/activities per year, four meetings, and payment of dues. Members may be considered as sustaining members if they pay dues annually or are life members but do not fulfill the minimum participation requirement of an active member. Anyone who does not meet the requirements of either an active or sustaining member for one full year will be dropped from the membership roster. Illegal drugs, firearms, and pets are forbidden at SAS events/activities. Use of alcohol by members over the age of 21 is permitted if the location of the event/activity allows. HOWEVER, impaired behavior will not be tolerated. As we deal with the public in general and children specifically, the SAS reserves the right to complete background checks as it deems necessary.